Once a sweet 2 year old that played nicely with her dolls and kitchen set, Puddin's life has spiraled out of control. Puddin is addicted to Dora... and she needs an intervention. Stunt Chad: Puddin' has always been such a sweet girl. At first, we did not let her even watch tv... but eventually, we crumbled a bit and allowed some Disney cartoons in the morning. How could it be wrong to expose her to Mickey Mouse, Special Agent Oso and the whole Little Einstein gang? She quickly became enamored with the whole crew. What amazed her mother, the Better Half, and I the most was the amount of information she was actually learning from this whole experience. Puddin: Trees are green. The Sky is blue. June likes to dance. Go rocket go!! Stunt Chad: We thought it was really cute—the way she would sit on the couch quietly for an hour immersed in the program. Eventually, we burned through most of the shows to the point where we were seeing the same episode maybe twice a week. Somehow, and I am not sure how, she started hitting the harder stuff... Seseame Street. Puddin: La, La, La, La... La, La, La, La... Elmo's World. Stunt Chad: It was bad. She was riding the crimson dragon baaaad. Elmo this. Elmo that. We thought we could break the habit by stopping the tv watching, but the red devil is everywhere! We couldn't pass a toy aisle at a store without spending at least half an hour pleading that she come with us... for her own good. The Better Half (sobbing uncontrollably): I just wanted to make her happy. I never thought it would end up like this. Stunt Chad: We talked to some professionals and they recommended that we try distracting her with other activities, such as bike riding or book reading. Confident that we were doing the right thing, we took her to the local library (sniffling and starting to cry). It was there where we started to hit rock bottom. (Banging fist on table)... It's my fault! I checked out the first Dora book for her! It was my fault! How was I supposed to know? Huh? I mean... it was a book. What damage could be done... (sobbing). If I could only go back in time and stop it. The Better Half: At first, we were excited about her interest in the library... but eventually, the one Dora book turned into two. And then two turned into four. And then all of a sudden, we start reading Diego! Before we knew it, she was up to an 8-book habit! We started to break down. Stunt Chad: We were just so tired of fighting it. It started to impact our marriage. All day long, all we heard about was Dora this and Boots that. We started fighting about everything. We kind of just gave up. I won't say it was the right decision, but we didn't know what else to do. The Better Half: That's when she started watching the tv shows and getting DVDs from the library. Rather than always fight with her, we just gave in. We just didn't have the energy anymore. We hoped that it was just a phase.... God, I wish we would have seen where it was heading. Stunt Chad: One night, after an entire day of listening to the show, I lost it. I grabbed all the books and DVDs and threw them away! Puddin: (angrily swinging at the camera) Swiper no swiping!!! The Better Half: She actually started going through detox. She would wake up shaking and asking "Dora today?" and "I need Dora." I actually caught her rocking back and forth sucking her thumb one morning mumbling "I'm the Map. I'm the Map" over and over. Stunt Chad: Not wanting to see my baby hurt, I gave in and let her watch one show a day... but I am worried that she is sneaking a book here and there. She has even started calling her blanket Boots. I think we have finally hit rock bottom. It is time for Intervention. After a recent nap, Puddin awoke to a living room filled with her friends, family, and stuffed animals. The entire room went around and shared with her their concerns about her addiction and how it made them feel. One painfully touching moment was when Stunt Chad read his letter.. Stunt Chad: Puddin, it hurts me to see you like this. When you were born, I had such great visions of the woman you would become. I thought I had the ability to help you along your journey... (starting to cry) But I failed you. I stand here a father that has become ashamed of himself for allowing this situation to become what it has. When you watch Dora, you lose touch with all reality. You are no longer Puddin... and that makes me sad. There is so much more to this beautiful world that I want you to know about... but I fear that you will not be able to see it because of Dora. I feel that you are getting a skewed perspective on what the world is. There are no magic maps. There are no talking back packs!! Damnit, monkey's don't wear boots!! All problems can't be resolved by solving three puzzles. And finally.... randomly asking people to answer obvious questions of where something is and then celebrating it doesn't make you look smart, it makes you look stupid. I miss my daughter. I miss my Puddin. I want it to be like the old days. I want you to come back to your daddy and leave all of this madness behind. Can you do this for me? Will you go to the National Center for Dora Detox for daddy? Puddin: (looking down at the ground)...Daddy...I sorry... Let's Go!!! Vamanos! Since this recording, Puddin has been Dora free for 43 days. She become very involved in her neighborhood play group and has started to focus on her finger paintings. She still has days where she gets the urge to "Explore with Dora", but she thinks about the pain she has caused others and resists the temptation. 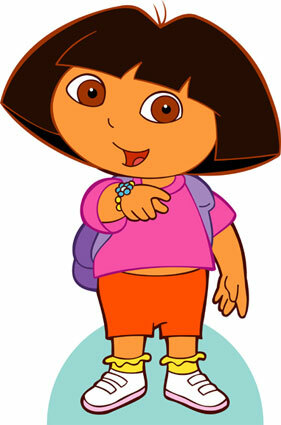 If you know someone that needs a Dora intervention, please contact Stunt Dad. Addiction is a serious problem and we are here to help. Do you have a child addicted to a cartoon character? If so, who. Let us know in the comments below. It's not a mommy blog. It's not a daddy blog. It's a Stunt Dad blog. I am one of the helpless mom. Me and husband were really worried about my daughter.When she was 1 i was reading her books and she was counting numbers soo well.Once we ha ppened to go to a friends house there they gave her a dora doll for everyone.Dad of the birthday girl was telling proudly that his daughter is dora addict.He thinks its a very good learning interactive too for children.He and his wife being educated how can they be soo stupid.We played one episode of dora and my husband taught dora is mentally retarded.She slowly started to get addicted.First she showed no interest which i taught was safe and let watch.She got addicted before we can realize.She was watching five to six episodes a day.She used to watch for hrs and hrs.I started to get worried and it came to a point my husband started to sing dora songs on our way to work.He knew what comes next in dora episode.Am like you what is wrong with? We finally got tired of listening to dora.It was a mental torture.Luckyly after few days netflix removed dora from the list and made it paid.There was no more dora which was a huge huge relief.She got introduced to strawberry short cake which was lot better than dora.After a few days i tested her and was shocked to see.She lost her math and interest in reading.A little girl once who was counting upto 8 is not able to tell a single number nor an alphabet.She lost interest in reading.When she counting at 1 i taught i had a genius daughter.Look what dora had made her into.Every time i think about it it makes me furious.Dora has impacted my daughter and made her loose some thing valuable.Now she is 3 and she started going to school from 2 soo she doesnt really have time for TV.Now am happy she is playing with blocks and kitchen toys which I am happy.Me myself being a teacher and has worked in early childhood for 3 years have failed.I feel ashamed of my self eveyday how can i let this happen to her inspite of knowing everything.I did so much reseach on montessorri teaching and child development, implemented on my daughter.The results were so good.I just put all my effort down the drain by letting her watch that stupid dora.I was shocked every time i asked a question she never had her answers.Dora has impacted her head to a very bad extent.It will eat up the mind before its toolate.